Often the school is left as an institution seemingly ethically neutral, leaving untouched questions about whether the school itself is a site of injustice toward both educators and children. 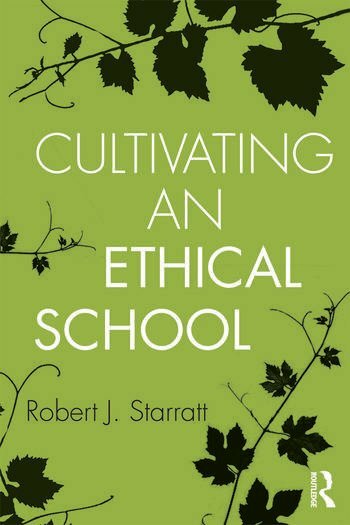 Springing from his well-known Building an Ethical School, Robert J. Starratt now looks more closely at the educational leader’s responsibility to ensure that the whole fabric of the educational process reflects an ethical philosophy of education. Starratt argues that the work of educating young people is by its very nature an ethical work as well as an intellectual work, and that this work inescapably engages educators and their pupils with an academic curriculum, a social curriculum, and a civic curriculum. Cultivating an Ethical School lays a foundation for educators seeking to cultivate a comprehensive ethical educating environment. The second half of the book then takes up the more specific perspectives on teaching and learning that constitute the heart of cultivating an ethical school. Starratt provides examples of how an ethical school can expose students to a variety of perspectives on the challenges they will be called upon to face in the worlds of culture, nature, and society. This valuable book shows leaders and educators the importance of organizing a curriculum and a pedagogy that simultaneously respect and cultivate the intellectual, personal, and social qualities of being human. Robert J. Starratt is Professor of Educational Leadership in the Lynch School of Education at Boston College. He received the Roald Campbell Lifetme Achievement Award in the field of Educational Administration, awarded by UCEA in 2006.